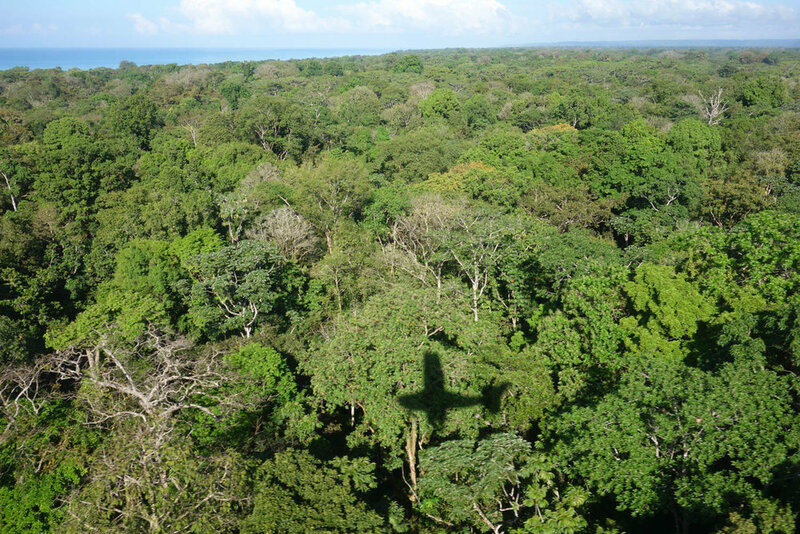 In January, 2015 we took a one-week trip to Costa Rica. The main goals were to visit a few of the national parks and see the amazing flora and fauna. We booked a couple of Airbnb places for the first half of the week and leaving the last few days flexible. We flew into San Jose arriving in the evening so we spent the first night in Cartago after renting a car. 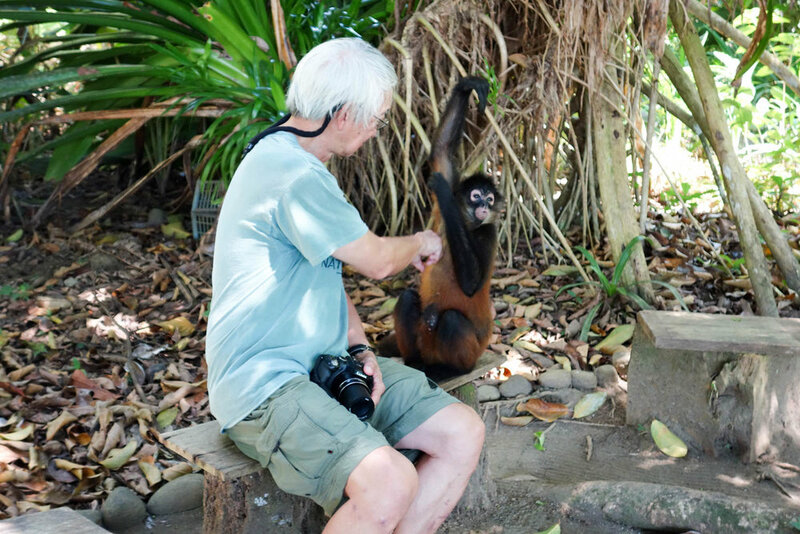 The next morning we drove down to Quepos with the aim of visiting the Manuel Antonio National Park. On the way to Quepos we made a stop at the Mirador de Quetzales off of highway 2. There we went on an informal tour where they took us to a spot where the fabulous resplendent quetzal (Pharomachrus mocinno) could be seen. Basically the bird feeds on wild avocados which are on some farmer’s land and the guides know which tree they are using that day. We drove to our Airbnb in Quepos for the second night so that we could get to the Manuel Antonio National Park in the morning. As you walk up to the park, there’s a horde of guides that approach to offer their services. While you can enter the park without a guide, we were advised to hire one, which turned out to be an excellent idea. 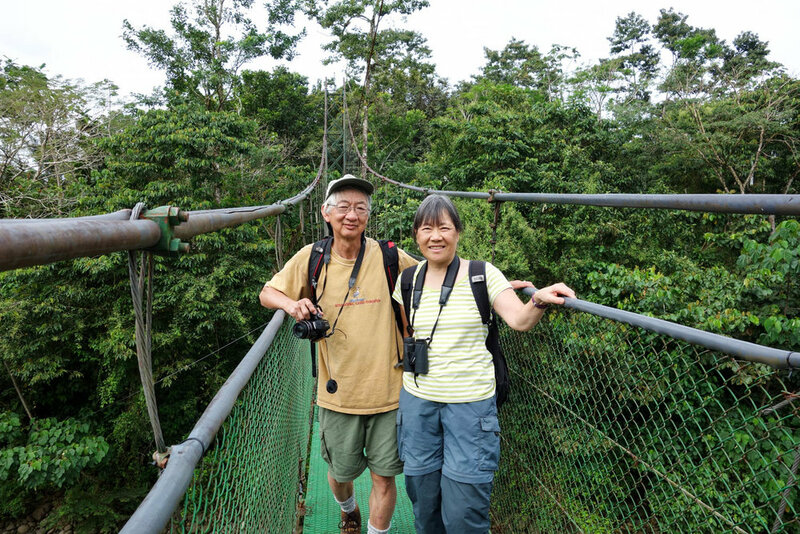 The main benefit of having a guide is that they are extremely skillful at spotting wildlife in the rainforest. There were numerous examples where they pointed out animals that we had difficulty seeing even after they pointed out where the animal was. Sometimes I wondered if they had placed the animals there beforehand. Obviously they have a good understanding of the animal’s habitat and habits, but they must also have great vision. Bat hiding under a leaf. I have no idea how the guide knew it was here. Capuchin monkey video. While I was taking this video, unbeknownst to me, another pair of monkeys were being harrassed by some tourists. The awkward ending of the video is because one of those monkeys came dashing through the trees and pushed off my shoulder while running from the tourists. Needless to say, I was very surprised! After two nights in Quepos, we then drove to Puerto Jimenez, which is close to the Corcovado National Park. On the way there we stopped at a couple of parks with rainforest walks. On one of them we saw a wonderful army of leaf cutter ants. The leaf cutter ant highway can be seen running left/right across the picture. A squadron of pelicans. A Tico, as they refer to Costa Ricans, joked that they were the Costa Rican airforce. The day that we arrived in the small village of Puerto Jimenez, we made arrangments to go to Corcovado NP. One has to have a guide to enter the park and from Puerto Jimenez the only way to get there is to fly in a small aircraft. So we made the arrangments to do this, but we could only get reservations for the day after next. Our Airbnb was located in the back room of a rather nice restaurant, the Il Giardino, which is located right on the beach. So we first spent a day going to the Osa Wildlife Sanctuary which is across the bay. The sanctuary was actually closed for vacation but could take a small number of visitors. To get there we hired a boat which would also take us to go see dolphins in the bay. Another couple was also on the boat. The dolphin hunting was very successful as we attracted a number of dolphins who were curious and came up to the boat.At the sanctuary they had a number of animals that were been rehabilitated but the most interesting thing was a spider monkey that they named Sweetpea. Sweetpea was wild in the sense that it lived outside the sanctuary in the jungle, but it liked to be groomed by the tourists. Apparently in its troop it is the lowest ranking monkey so no other monkey would groom him. But he has discovered that tourists are delighted to groom him and he is very particular about how and where he likes to be groomed as can be seen from the photos and video. The next day we drove our rental car along the beach to reach the ‘airport’ at Carate. It is the most unassuming airport in the world, with nothing more than a short runway. But the boarding area is a rainforest where we saw a number of colorful birds, a toucan and scarlett macaw. We then took a short flight into the national park. This is the view out of our bathroom at Il Guardino Airbnb. Note there are no curtains and the mangrove swamp view. Our next stop was an Airbnb at Heliconia Island in the Sarapiqui area back towards San Juan. In the drive up there we passed the famous bridge at Rio Tarcole where there was a swarm of crocodiles sunning themselves on the bank. 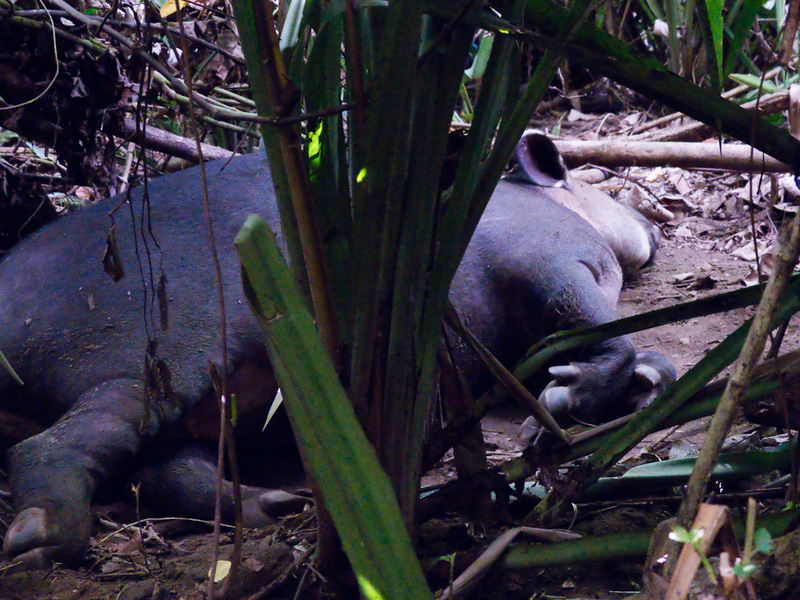 We also visited the Tirimbina Reserve. The grounds of the Heliconia Island Airbnb were beautiful with well landscaped flowers. Surprisingly we had booked it just the night before because we changed our plans and left Puerto Jimenez a day early to visit the Sarapiqui River region. 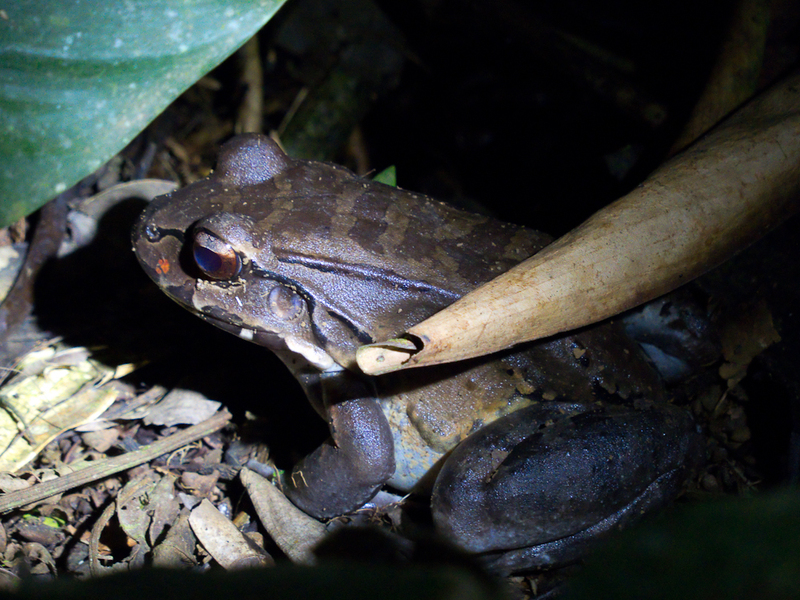 To see the colorful rainforest frogs which come out at night, we went to a place called Frog Heaven where they basically have a rainforest that has lots of frogs. They accompany you with a flashlight and find the frogs in the wild. They found lots of colorful frogs including the iconic frog of Costa Rica, the red-eyed tree frog.